Minimum Order Quantity	5 Piece Dose/Strength (ex. 1 mg or 1ml)	600 u/kg twice wkly for 3 wk before surgery. Packaging Size	4000 IU x 1 mL x 1ml Packaging Type	Injection Usage	Clinical, Hospital, Personal, Pharmacy Drop Shipper & Medicine Drop Shipper "Erythropoietin Alfa" and is used for ANEMIA due to chronic kidney disease/ treatment of cancer/ critical illness/neurological disease . "Erythropoietin Alfa" world over known by brand name "epoetin/Epogen/Procrit"
Minimum Order Quantity	10 Piece Dose	1 mg/day Usage	Commercial, Clinical, Hospital, Personal, Pharmacy Drop Shipper & Medicine Drop Shipper Packaging Size	1 mg x 10's Packaging Type	Tablet Anastrozole is a potent and highly selective non-steroidal aromatase inhibitor. In postmenopausal women, oestradiol is produced primarily from the conversion of androstenedione to oestrone through the aromatase enzyme complex in peripheral tissues. Oestrone is subsequently converted to oestradiol. Reducing circulating oestradiol levels has been shown to produce a beneficial effect in women with breast cancer. In postmenopausal women, anastrozole at a daily dose of 1 mg produced oestradiol suppression of greater than 80%, using a highly sensitive assay. 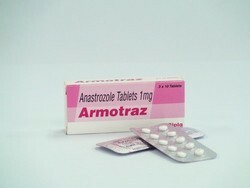 Anastrozole does not possess any progestogenic, androgenic or oestrogenic activity, but does perturb the circulating levels of progesterone, androgens and oestrogens. Please keep +1 before the number when you dial. Minimum Order Quantity	5 Piece Packaging Size	Bottle of 8 capsules Dose/Strength	50 mg capsule Packaging Type	Bottle Posid 50 (Etoposide ) an anti-cancer agent, prescribed for lung cancer and testicular cancer. We assure quality of product of long expiration date and ship in discreet packing Drug information on Posid (50 mg) (Etoposide) from Onco-care (Cadila Pharmaceuticals Ltd) ... Etoposide Drug Information. This medication is an anti-cancer agent, prescribed for lung cancer and testicular cancer. Minimum Order Quantity	3 Piece Packaging Size	4.5 mg Packaging Type	Injecttion Dose/Strength (ex. 1 mg or 1 ml)	4.5 mg Usage	Clinical, Hospital, Personal, Pharmacy Drop Shipper & Medicine Drop Shipper ZOLDONAT (Zoledronic acid) used to treat Paget's disease of bone (a condition in which the bones are soft ,weak, deformed, painful or easily broken). ZOLDONAT (Zoledronic acid)) is used to treat high levels of calcium in the blood that may be caused by certain types of cancer. Minimum Order Quantity	100 Piece Packaging Size	Strip of 10 Capsules Dose/Strength	Adult: PO Monotherapy: Initial: 50 mg/day, increase gradually if needed. Maintenance Packaging Type	Strip P-CARZINE(Procabazine)an alkylating anti-neoplastic agent used in the treatment of cancer, damages DNA, inhibits DNA, RNA and protein synthesis.P-CARZINE(Procabazine)is able to block the MAO action in the CNS. P-CARZINE(Procabazine) is prescribed in conjunction with other medications to treat stages 3 and 4 of lymph nodes (Hodgkin's disease) or solid tumors including brain tumors. "MISOPROST(Misoprostol) " used to treat missed miscarriage, induce labor and induce abortion,prevent gastric ulcers. "MISOPROST(Misoprostol) " can also be used to dilate the cervix in preparation for a surgical abortion, particularly in the second trimester. Minimum Order Quantity	1 Piece Product Type	Finished Product Dose	As per prescription Usage	Commercial, Clinical, Hospital, Personal, Pharmacy Drop Shipper & Medicine Drop Shipper Packaging Size	Pack of 3 tablet Strip of 1 tablet Packaging Type	Strip "MTPill" 200mg.pack of 3 tablets is used as an abortifacient in the first months of pregnancy as it has antiprogesterone and antiglucocorticoid properties.